For a while now we have been fishing (and having good luck) using a drop shot. There are several types of drop shot out there, The Carolina rig, The Texas rig, and the Wacky rig to name a few. We use our own rig that I will call "the Guildig rig". Using this rig we have caught Bass, Carp, Trout, and Catfish. You start with a swivel hook. 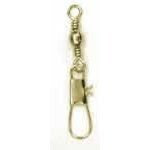 Tie this to the end of your fishing line on your fishing pole with a clinch knot. This way you can change out from a drop shot to a lure quickly if you need to. If you want it more Carolinaish put a bead on after the bullet weight. To use this, attach a slip bobber on the end of you pole above the swivel hook (the bobber should allow the line to pass through it freely). Attach your newly made drop shot to the swivel hook, attach a fish hook to the swivel hook at the end of the drop shot. The purpose of the drop shot is to fish on the bottom. The purpose of the slip bobber is to show were your line is, and to give a visual signal if the line has a bite. The slip weight helps in casting, holds the line on the bottom but does not offer resistance when the fish bites. Once your drop shot is ready, bait it. For Carp use corn or dough baits, for Trout use corn (if using corn for trout or carp completely cover the hook) or live worms, for Bass use live or fake worms, for Catfish use anything edible. For Carp, Trout, and Catfish, cast where the fish are (usually in the water), let the line sink to the bottom, if your slip bobber is attached correctly it will slowly walk up the line and stop at the surface. now wait, and watch the bobber. When it disappears under water set your hook and reel in your fish. 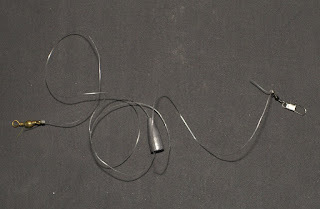 For Bass remove the slip bobber if using a finesse technique, or leave it on if using live bait. 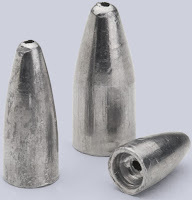 Drop shots work best in lakes and ponds with relatively smooth bottoms. Here in Phoenix we have used this rig at many of the local urban lakes, and the Tempe town lake. If fishing with corn, It works much better if you chum the waters around where your hook is on the bottom with extra corn. Chumming is legal in Arizona as long as you don't over do it. 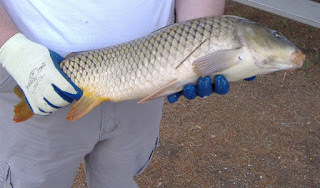 Chris and I were bored and since the lake was refilled, and Mike said he saw a lot of carp in it, we went fishing this morning. Chris caught 2 carp and I caught 1. I caught him on my smallest rod with 6 pound test, and 3 pounds of drag. He put up a fight for about 5 to 10 minutes. I almost caught a 1 pound bass. Some other guy caught a 6 pound catfish. There are usually 2 sets of these separated by a car length. They are designed so that if there are 3 or more cars at the intersection they will get the green arrow. 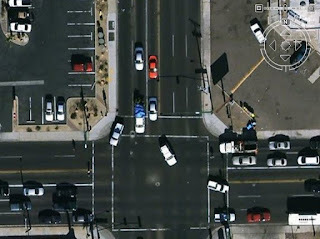 At some intersections there are only one and are used to let the traffic light control computer know that a car is present at a low traffic intersection. However at the intersections with 2 you can control the leading left arrow. Here is a real world intersection at 24th st. and Thomas. Once again you are the red car. The silver car is all the way on the front sensor, if you were to pull up right behind him there would not be enough metal over the second sensor to trigger it. Once again if you get there soon enough you get the arrow. These sensors can be triggered by motorcycles, and I have read that bicycles will also if they are large enough and are made from steel. 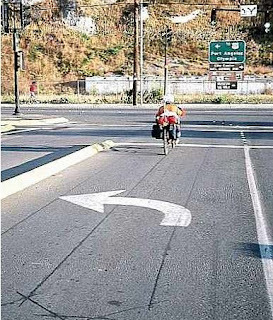 Motorcycles and Bicycles must stop on the center of the sensor to have any chance of a trigger. These intersections are all over town. I have used this technique successfully for years. Now go forth and control the traffic lights, don't let them control you.